Kidnappers of President Goodluck Jonathan’s uncle are not smiling at all as they have reportedly rejected N30 million offer made by the family. The 70-year-old was abducted by unknown gunmen 13 days ago in Otuoke, Ogbia Local Government Area of Bayelsa. PREMIUM TIMES reports that the president’s family members have resorted to prayer sessions to seek divine intervention. Perhaps seeking to supervise the release of his uncle, President Jonathan arrived Otuoke, his hometown, on Thursday. Prior to Mr. Jonathan’s arrival and since the kidnap, there has been a heavy presence of security operatives in Otuoke. 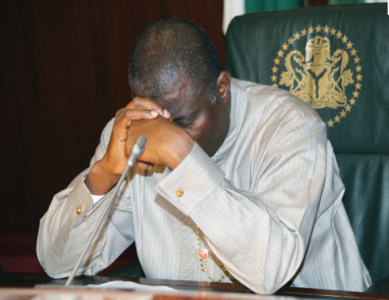 There are rumours in Otuoke that Mr. Jonathan’s presence may facilitate the release of funds to pay the kidnappers. Mr. Inengite reportedly played a vital role in funding Mr. Jonathan’s undergraduate and post-graduate studies. The gunmen had earlier established contact with the family and demanded for a ransom of N500 million to free the victim but were offered N30 million by the family, family and security sources told PREMIUM TIMES. The kidnappers reportedly dismissed the offer which they described as a joke. They warned the family to meet their demand. The police spokesperson in Bayelsa had told PREMIUM TIMES on Wednesday that the police was doing its best to free the victim. Kidnapping has been on the rise in Bayelsa despite a law that punishes the crime with the death penalty. Many victims’ families secretly pay ransom to kidnappers to free the victims but I wonder why the president's family would make such offer when they know it is not proper to negotiate with kidnappers. I pray for his safe release though.